First, Lincoln, Neb.-based Executive Travel began quietly building up an escorted tour company called Convertible Caravans of Europe that dumps the motorcoach to redefine the escorted touring model. Now comes Swiss conglomerate Kuoni Group’s new, U.S.-based experiential tour company, Brite Spokes by Kuoni, a themed product aimed at the millennial market. Last year, Kuoni’s U.S. subsidiary, ATP in New York, did a soft launch of Brite Spokes. This year, the company rolled out a complete product lineup, featuring a series of itineraries categorized by themes such as Adrenaline, All in the Family, Teen, Health and Fitness, Knowledge and Future Experiences. Those themes drive the search. For instance, on the Brite Spokes website there is currently no way to search by travel destination, only by experience. Clicking through the various experiences will ultimately provide an itinerary in a given destination. So, click on “All in the Family,” and a couple of options will crop up: “Cover Your Bases” and “Legends Continue” series. Once travelers zero in on a itinerary that interests them, details such as where it takes place, the length of the trip and its price are finally provided. “We knew that we needed to do something in the marketplace to spark some interest,” Morello said of this new approach to touring. What began as a handful of domestic group itineraries is rapidly expanding to what will be well over 150 departures within the next year throughout the U.S., with plans to expand into international destinations on the horizon. Brite Spokes is also in the process of developing its FIT division. “The trips that we developed, each of them offers some exclusive element,” Morello said. For example, Brite Spokes’ sports-oriented Legends Continue itineraries promise interaction with former pro athletes. For its health and fitness itineraries, the company has partnered with Crunch Fitness to develop itineraries that incorporate active workouts. The product is geared toward the higher-end millennial travel market, with, for example, a two-day rally racing itinerary outside of Boston or New York starting at $5,350 per person, based on double occupancy. A two-day, sports-themed Legends Continue itinerary in Cleveland is priced at $1,950 per person, double occupancy. Brite Spokes offers commission. Kuoni’s investment in the new product offering is in line with the type of risk-and-reward mentality that has shaped emerging companies in the tech industry and could bring a similar kind of new energy to the tour business. “Brite Spokes represents Kuoni’s deep respect for innovation and belief that new products must be supported,” Yasser Noman, CEO of Kuoni Destination Management Specialists, said in a statement. While Brite Spokes targets the millennial generation, Convertible Caravans of Europe is zeroing in on baby boomers. The company is doing away with the traditional motorcoach style of touring, instead providing clients with their own car rental (included in the price). It also gives them a preprogrammed GPS on each day of the itinerary so that they can drive themselves from one tour stop to the next, with the option to skip or participate in as many of the group activities as they like. It’s “a whole new category of touring, focused specifically on the demographic of baby boomers who don’t want to be on a bus,” said Steve Glenn, chairman and CEO of Executive Travel. The vehicle provided for two people traveling together is a sedan with an automatic transmission (with one person insured to drive), and the vehicle provided for four people traveling together is either a manual or automatic station wagon (with two people insured to drive). Convertibles are available by request. 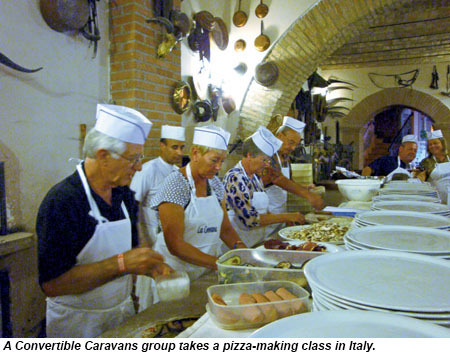 Convertible Caravans has developed itineraries in France, Italy, Spain, Greece, Ireland, Germany and Austria, including five classic itineraries, 10 independent itineraries, two golf-themed trips (with or without an accompanying golf pro), one “man-cation” itinerary, and an itinerary suitable for travelers with disabilities. Group sizes range from a minimum of eight people to a maximum of 20. Convertible Caravans doesn’t use any chain hotels, instead contracting with smaller, three- and four-star boutique properties in Europe. The company also tries to incorporate local producers and wine and food tastings at smaller, more intimate venues. 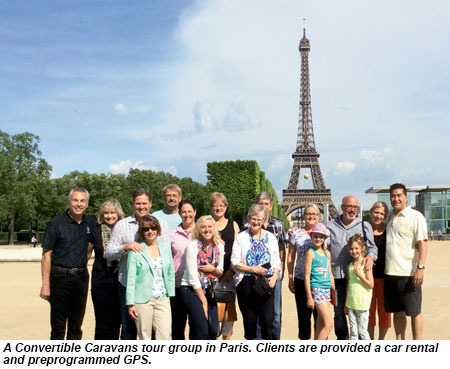 In addition to the preprogrammed GPS, passengers are provided with a prepaid cellphone so that they can be in touch with their “caravan concierge,” the Convertible Caravans equivalent of a tour leader. If they don’t want to drive themselves, they can pay an additional fee for a chauffeur. Each day, there are morning and evening briefings during which the group goes over the day’s route and sets up times to meet for lunch and for other stops. Clients can opt out of any of the rendezvouses as long as they inform the concierge. All itineraries are 10 days in length and are priced at $4,995 per person, based on double occupancy. Not included are one of each day’s meals, fuel (an estimated extra cost of about $300 per car for the 10 days, based on following the prescheduled route), parking and tolls. In 2014, Convertible Caravans saw an 80% increase in bookings compared with its first full year in operation, and it began adding guaranteed departures to its product mix. For 2015, the company is introducing a “Game of Thrones” route that explores the castles of France’s Loire Valley, Normandy and Paris; a “Bellissimo” tour in Italy, which starts in Venice and heads to Tuscany and Rome; and “Amore Amalfi,” which starts and ends in Naples and includes a night in Capri. In fact, the tour models embraced by Convertible Caravans and Brite Spokes are not entirely new, since a number of existing tour companies have seized on the experiential travel trend and have experimented with ways to get people off of the motorcoach. What is new is the fact that this part of the tour industry is inspiring entirely new tour companies that are being launched on the basis of experiential and nonmotorcoach travel models.